Leading Manufacturer of glue board insect killer, glue pad electric fly killer, glue pad fly killer 20 w, glue pad insect killer machine, glue pad mosquito killer 30 w and glue model flying insect killer from Coimbatore. Mute mosquitos control, gives you a sense of being in the library. 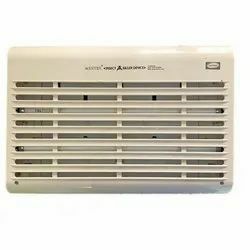 With elegant design,it can be decorated homes and efficient mosquito control. Easy maintenance, just replace the glue board once a month, save worry. Environmental protection and safety, no eletric shock, no toxicant in glue board, give you careful protection. Usage/Application Hotel, Office, Hospital, etc. Aesthetic design and housing is full of stainless steel, which is strong and durable. Wall mounted design saves place and more convenient for positioning. It is easy to replace the tubes and glue board without tool. Equipped with SUPER UVA tube using Philips technology, it is 30% more effective in attracting flying insects. Glue Pad Fly Killer 20 W, gives you a sense of being in the library. With elegant design,it can be decorated homes and efficient mosquito control.Easy maintenance, just replace the glue board once a month, save worry. Environmental protection and safety, no electric shock, no toxicant in glue board, give you careful protection. Application Home, Hotel, Office, Hospital, etc. This item is fully made of iron with white paint finished, strong and durable. Ultra slim body for wall mounting saves shipping fee. Equipped with SUPER UVA tube using Philips technology, it is 30% more effective in attracting flying insects. 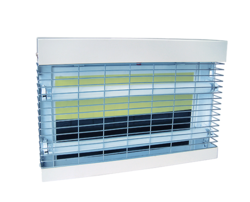 The reflecting translucent sleeves grid design enhances efficiency in attracting insects, the housing is combination of ABS/AS and iron with white paint, which is strong and durable and looks elegant. 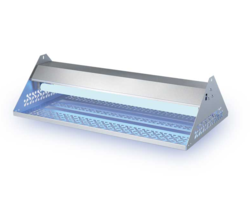 It is equipped with SUPER UV tube using Philips technology, 30% more effective in attracting the flying insects. Usage Food Processing area, Restaurant, Hotel, Hospital, Home, Kitchen etc. 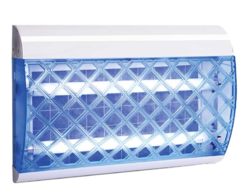 Glue Model Flying Insect Killer Developed to be the most effective glue board fly light on the market, the Wantrn Glue board Fly Killer is designed to catch significantly more flying insects than traditional glue boards. Wantrn Glue board Fly Killer utilities ultraviolet tubes to attract flying insects into the product, before trapping them on a sticky glue board. UV tubes attract flying insects by emitting a wavelength of light attractive to flies. Flying insects are attracted to the tube which emits UV at a level comparable to that of the sun, which the flying insect has a natural attraction to as a source of heat. Edge Glue board Fly Killers are designed for use in front of house areas, decorative fly killers discreetly protect areas which are highly visible to customers. Insects are attracted by UV light then retained with highly effective glue boards to ensure that flying insects are kept at bay. Edge Glueboard Fly Killers are ideal for use in restaurants, cafes, hotel lobbies, reception areas food service and dining areas. As the glue board is inserted into the Edge Glueboard Fly Killer it self-folds at the desired points, creating a unique form around high efficacy Synergistic UV tubes. 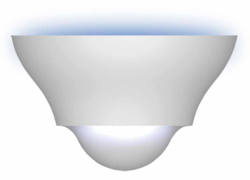 This unique design forms edges, proven to be more attractive to flies, maximizes useful UV light output, and creates a 30% larger glue area than traditional glue boards, creating a staggering 31.5% increase on a normal catch rate! 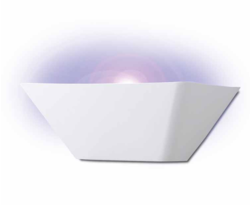 A beautifully designed, decorative fly killer, the Halo Curve is the perfect addition to front-of-house areas.The elegantly shaped facade is punctuated by stylish detailing, hiding caught flies from the view of customers in restaurants, hotels, cafes and bars, and finished with cobalt grey UV stable polycarbonate edging. Easy to service, the front guard pivots to allow quick and easy tool-free access to the two 15 W tubes and glue board, without the need to remove the guard during servicing. Unique, stylish design – Elegant detailing and slim decorative design.